The 2017 Honda Ridgeline is now in stock at Brilliance Honda in Crystal Lake, just a short drive from Elgin, IL. This redesigned pickup is available in a variety of trims, and the new RTL model is equipped with many upscale features. It offers lots of capability and capacity, so find out more about how the RTL is different from the rest of the Ridgeline lineup. The Ridgeline RTL comes standard with a 3.5L direct-injection V6 engine that produces 280 hp and 262 lb-ft of torque. The RTL is offered in front wheel drive, which earns an EPA estimated 19 mpg city/26 mpg highway/22 mpg combined when paired with a six-speed automatic transmission*. The all-wheel drive model earns 18 mpg city/25 mpg highway/21 mpg combined in EPA estimates with a six-speed automatic transmission*. When properly equipped, the AWD model of the Ridgeline is rated at up to 1,569 pounds of payload capacity and up to 5,000 pounds of towing capacity. The Honda Ridgeline RTL is equipped standard with features like a multi-angle rear camera, traction control, anti-lock brakes, and multiple airbags. It even includes daytime running lights, brake assist, and a tire pressure monitoring system. The Honda Ridgeline RTL can be found right now at Brilliance Honda located at 680 W. Terra Cotta Rd. in Crystal Lake, IL. 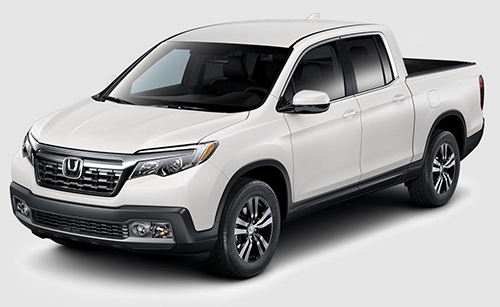 We carry a wide variety of current Honda models, so visit us today to find out more about the newly redesigned Ridgeline! *Based on 2017 EPA mileage ratings. Use for comparison purposes only. Your mileage will vary depending on how you drive and maintain your vehicle, driving conditions and other factors.